SHOES Did you know that shoes are the single most important piece of equipment for the walker? They can be the difference between having a fun, relaxing walk and an uncomfortable, painful one. 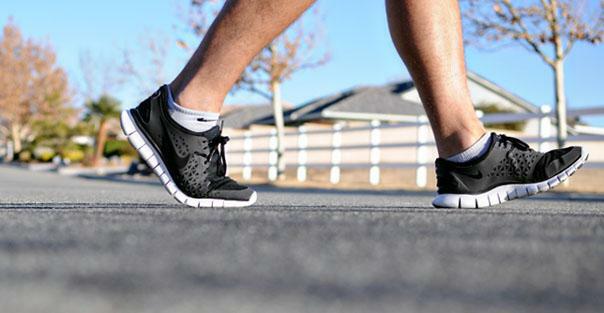 It is important to get a good pair of walking shoes with the following characteristics. While there are many shoes at various price ranges designed specifically for walking, a running shoe or tennis shoe will also serve the purpose so long as it is comfortable and has the above characteristics. Under normal weather conditions, there is great flexibility in the type of clothes you can wear while walking. While loose fitting clothing is best, this may also include shorts and a tee shirt or a warm-up suit. Cold Weather: Dress warmly wearing layers which trap the heat and allow you to remove layers as you get warmer. One guideline is to wear one less layer than you would if you were outside in that weather when you weren't walking. Also, approximately 30% of your body heat is lost through your head so wear a hat! Warm Weather: Wear light clothing but be sure to wear a hat and/or sunscreen to block the sun's rays. Precipitation: In rain or snow, a waterproof and windproof jacket make a great addition to your walking wardrobe. Many incorporate zip-in liners for colder weather or can be worn alone with vents for warmer weather. While there is no need to spend a lot of money on walking gear, there are a number of items that will make your walk easier, safer and more fun. Pedometers: A pedometer is the perfect way to enhance your walking. First of all, it's fun to know how many steps you've taken, how far you've walked, or how long you've been walking. Secondly, a pedometer allows you to keep track of your progress against the goals you have set for yourself. A pedometer will also show you the steps taken or distance traveled over one or several walks. Other options to track walking activity include Fitbits and iWatch which can allow you to connect with others for friendly competition. Reflective Products and Lights: If you are walking in the morning, early evening or night, reflective products are a must. Your gear can include a reflective vest and reflective bands. A flashlight or strobe light will also help you to be seen at night. Join a walking group Bring your favorite 4 legged friend!